While I can't tell you what to do, I can tell you that you are right, German Shepherds/mixes do shed a lot but if you brush the dog fairly frequently outside that will cut down on a lot of the hair indoors. As far as exercise goes, yes, she will need to be walked ever so often outside so she can "do her business" and get some fresh air too but you'd be surprised just how much of a couch potato GSDs can be once they are comfortable inside their home. And yes, they do have big paws and bodies and tails but if you have any sense of humor at all you'll get used to it fairly fast. And won't mind it at all in the future. Plus they have big hearts to love you with! Take your JRT to meet her a few times - if they get along well then you have accomplished a lot right there before you even bring her home. The fact that they get along is so important! She will eat more food and require exercise but not loads - you can even play with her in the house. And if she already knows plenty of tricks practice those with her and maybe even teach her new ones. That's perfect for keeping her mind happy and healthy too. Good luck with your decision either way - that's a toughie but you have to decide what is best for you, your family and the dogs too! 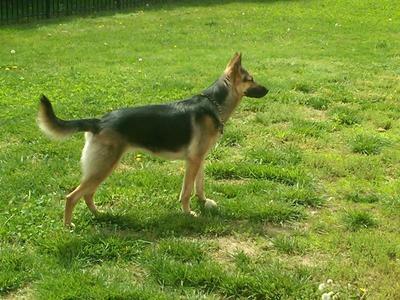 Comments for German Shepherd - Should I Get One? "German Shepherd - Should I Get One"? That decision must be yours alone, no one can make that decision except you. But what I can tell you never find a more Protector than a German Shepherd, it is in their blood. They do shed so you need to brush them, but so what, take of children, take care of a dog. The Love of a dog and the Joy you get will out weigh anything negative. We had Shepherds going up, first with Kelly, I named her from the movie Kelly and Me with Van Johnson, Princess, Cleo, Foxy(male). Mia, my beautiful GSD just turned 3 on 11/10/12. She loves to play with her balls, my shoes,socks, daddy's gloves and socks, I love it and she gets so excited. Dogs Love unconditionally, you will never find a more True companion - who will Love you no matter what. Please read our stories german puppy Mia story and Mia my beautful german shepherd. Bonnie sounds Great and if you don't take her, someone will, its your decision - Good Luck!